Who you are as an individual is no accident. An Infinite Being with extreme precision designed you. You are you, because you were meant to be that way. You can’t escape it, and if you try, you will be both unhappy and fall short of your potential. The answer was “Be yourself.” That’s what they need to hear from me. So much of life is spent acting or pretending to be something you aren’t. Society pushes and pulls us in so many directions that don’t feel right. But we go with the flow. We don’t want to stick out. We don’t want to seem out of it. We want to be part of the “in” crowd. We want to achieve success and things, no matter the sacrifice to our soul. How do we instruct them to find this inner peace? Where is his acceptance of a Higher Power and the fortitude to follow the passion of their life with peace and love? The message I received was to find a place to seclude myself in order to find me? Unless the seclusion causes me emotional/psychological problems, it will help me find peace. Seclusion is one of the most powerful tools for spiritual growth, and was used throughout history by prophets, kabbalists and holy people. To make sure you’re using the tool correctly, it’s good to have a mentor for this type of activity. If you find it difficult to get away, you can make a space in your home for seclusion and introspection, meditation and prayer. But ultimately, the goal is to live amongst society, while retaining your integrity. It is true that isolation is detrimental, and I am not saying that we should remove ourselves from our community or fellowship. We need to be apart of the lives of others. We cannot remain reclusive. We must go out into the world and make it a better place. But we can only do so if we have perfected the individual God created us to be. Practice your trumpet alone in a room, away from others. When you have perfected your instrument and found your own music, come to the band, share what you have to offer, and join the holy orchestra. 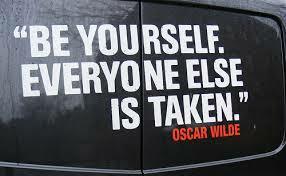 Spend time this week meditating on the thought: Be yourself. Try to discover ways to make yourself more of the real you.